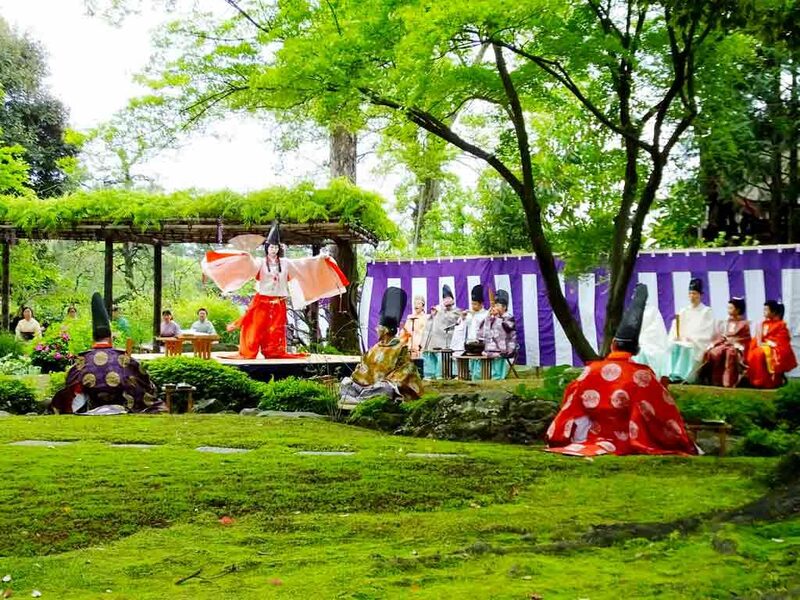 Do you want to see people in kimono (Japanese traditional garments) enjoying themselves in the ancient way? 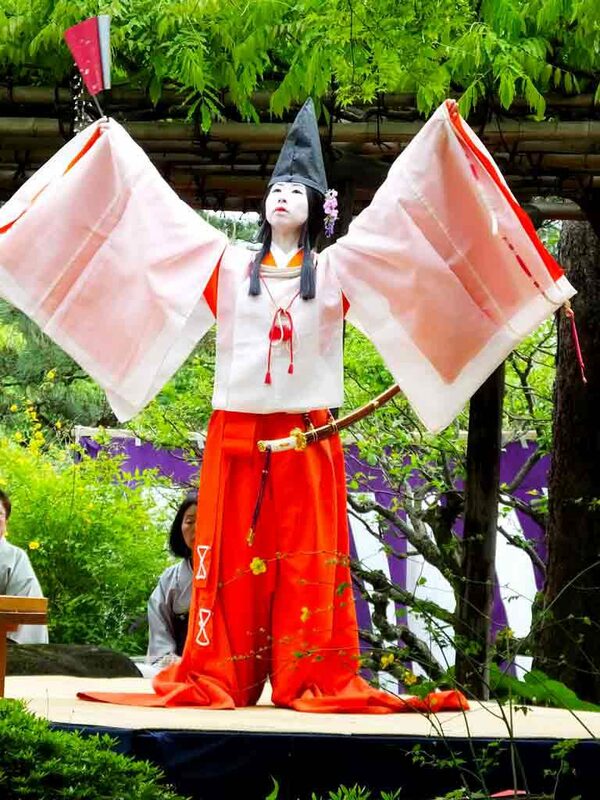 Then go to Jonangu Shrine for Kyokusui-no-utage ceremony. 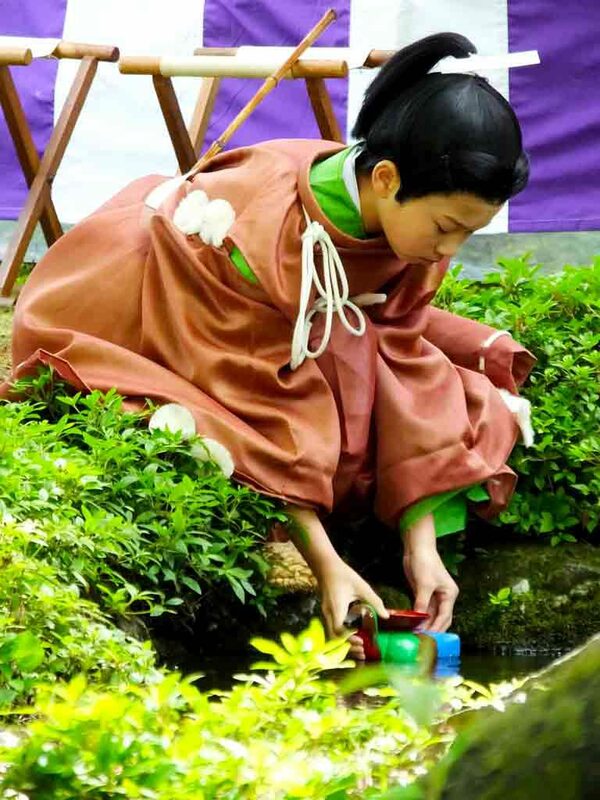 Wearing colorful kimono, some men and women write tanka (short Japanese poetry) and drink sake(rice wine), just like people in the Heian period. You can see it for free. 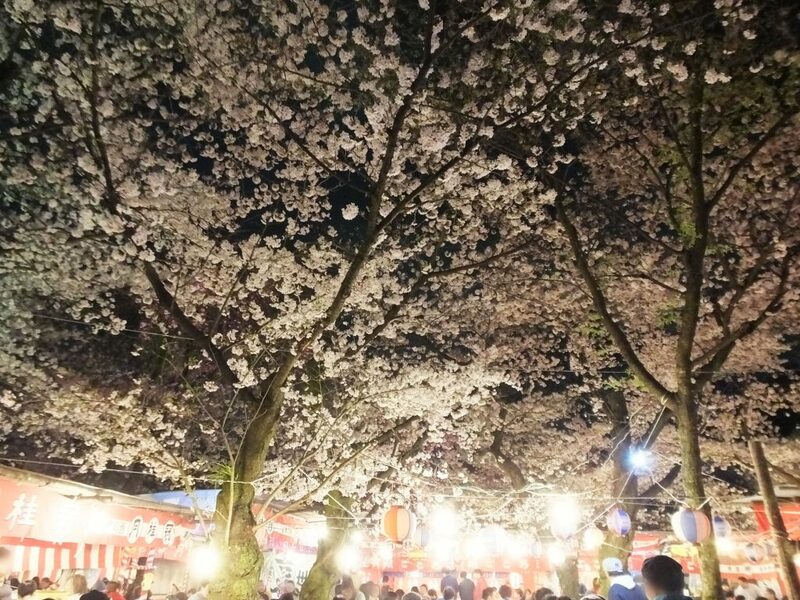 It’s held on April 29th and November 3rd every year. You don’t need a reservation. I went to see it this spring. The ceremony starts at 2:00 p.m. and ends around 3:00 p.m. At 11:40 a.m, I arrived there and found several people already waiting on benches there! I was astonished and hurried to sit on the front row. Even if you don’t need a seat in the front row, maybe you should arrive there at 1:00 p.m. because it’s so crowded. 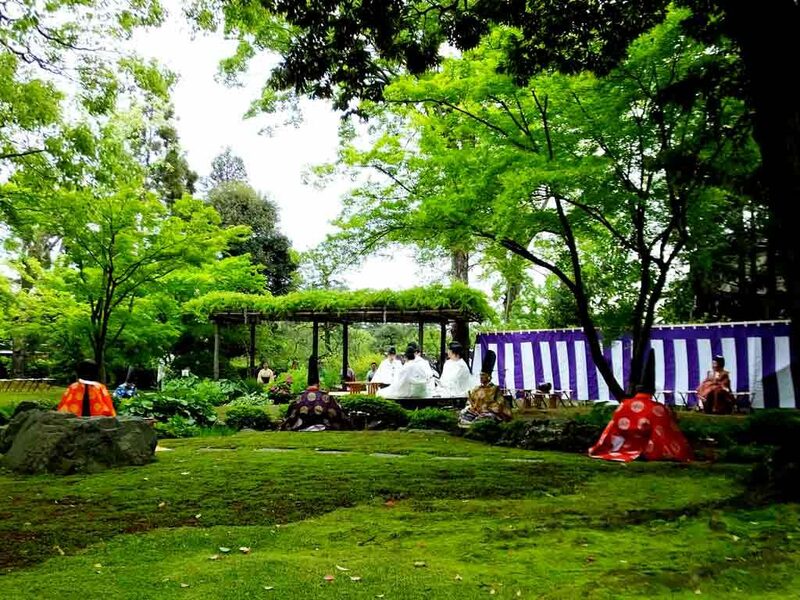 If it’s rainy, the ceremony isn’t held in the garden. 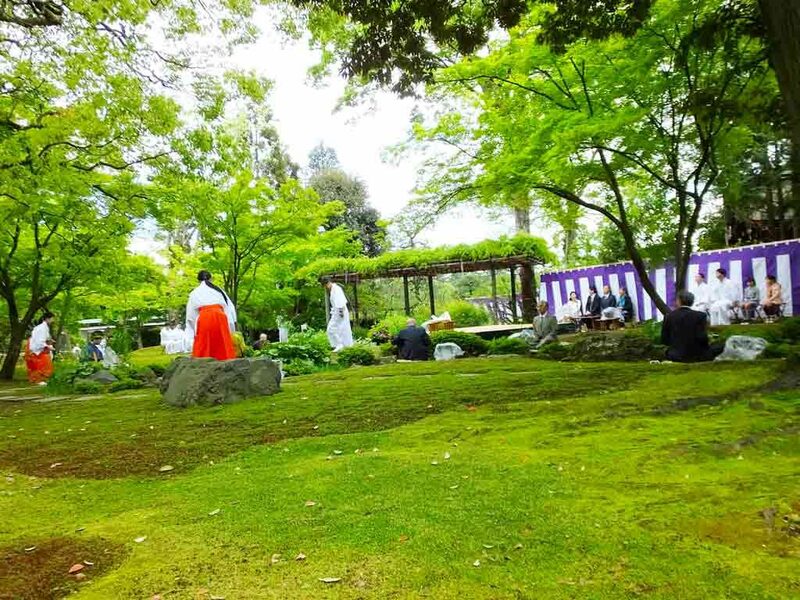 Actually, the garden has a stream, which is very important for the ceremony. The weather was unstable that day, but it was held in the garden as usual. What a relief! Before the ceremony, they had a rehearsal. While waiting for the ceremony to start, you can listen to the timbre of Japanese traditional stringed instruments, koto. It was drizzling mildly. 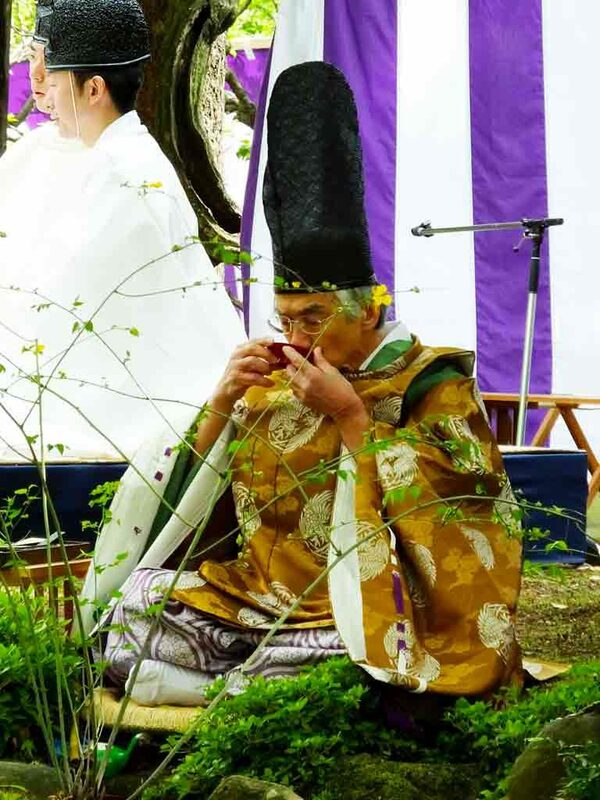 Kyokusui-no-utage ceremony started 10 minutes late. 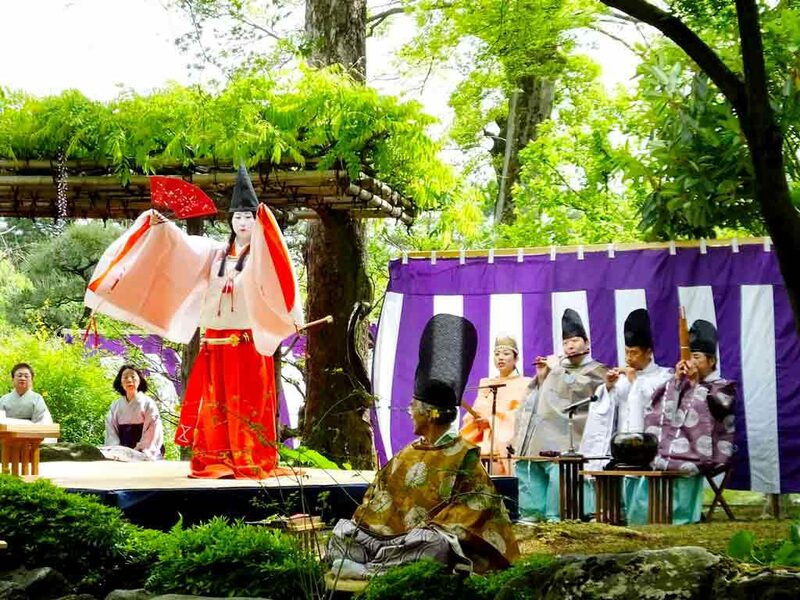 A Japanese traditional dance was performed on the stage. 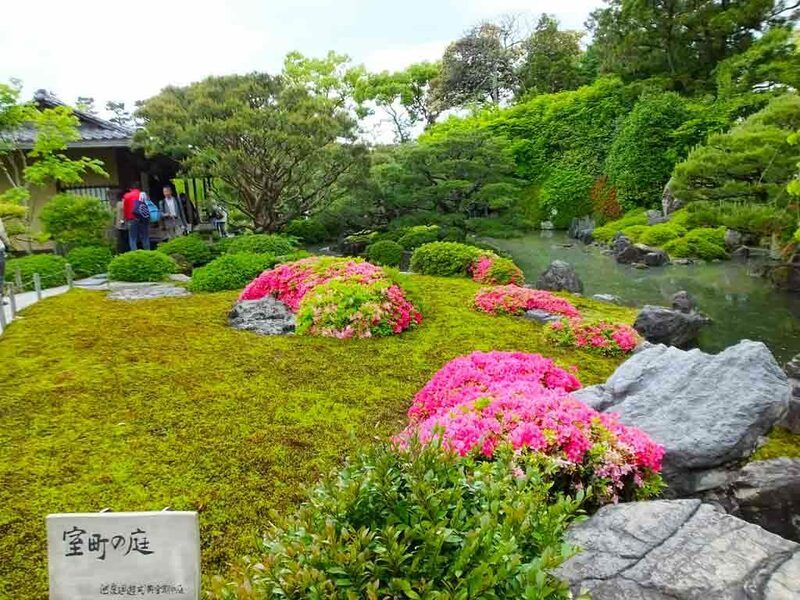 Watching the elegant dance in the beautiful mossy garden, I felt as if I were a noble in the Heian period. Next to the stage, three men were playing music, and one woman was singing alongside. You can see them in the right side of the next picture. Look at the woman dancing gracefully. What attracted me the most was the contrast between the serenity of her face and the sword at her waist! 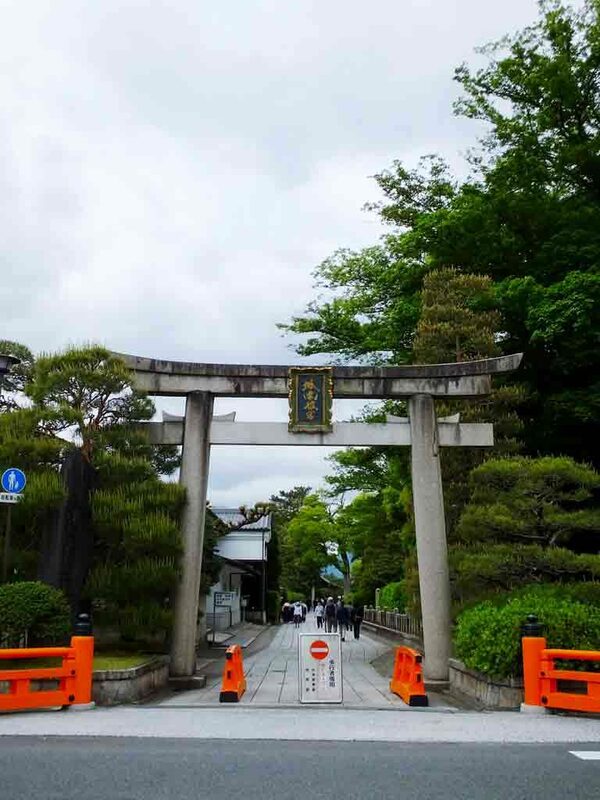 Later I learned that women, as well as men, had weapons in the Heian period. The theme of tanka (short Japanese poetry) that day was declared. It was “flowers of deutzia.” They are small flowers seen in the spring. 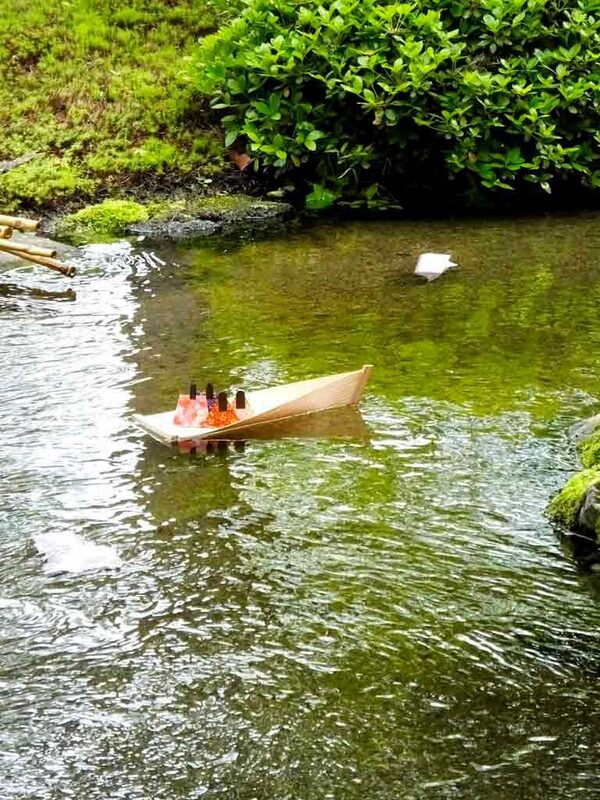 A sake cup was put on a tiny bird-shaped boat and released on the stream. Each poet has to complete tanka before the cup reaches him/her. Poets sitting by the stream started writing tanka. A poet finished writing tanka and picked up a cup when it reached him. Then he drank sake in it. 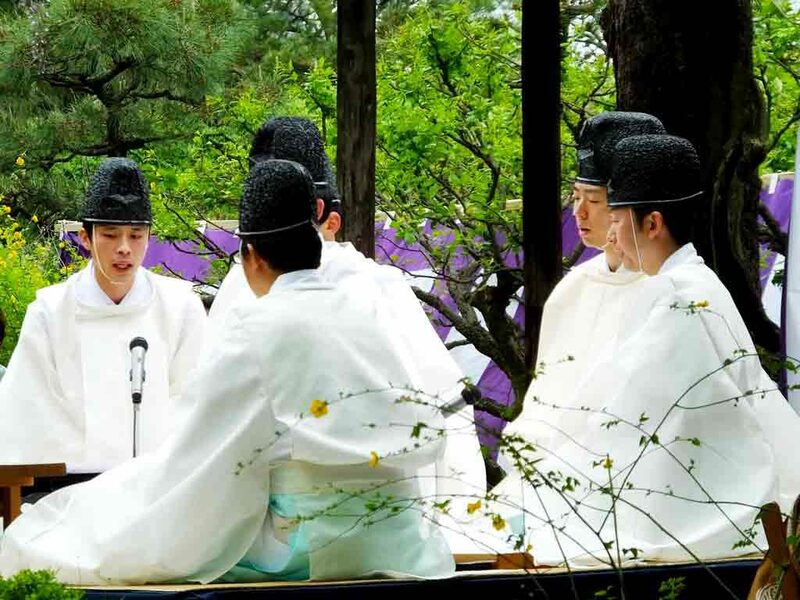 The name of the ceremony “Kyokusui-no-utage” means “drinking party at a stream.” It’s a kind of party, but of course there is no fuss. It was getting sunny and warm. The sunlight filtering through the leaves of trees dropped on moss in the garden beautifully. As if singing, several men were reading aloud tanka (short Japanese poetry) that has just been written impromptu. Tanka is written in archaic Japanese, so I bet only few people there understood the meaning! 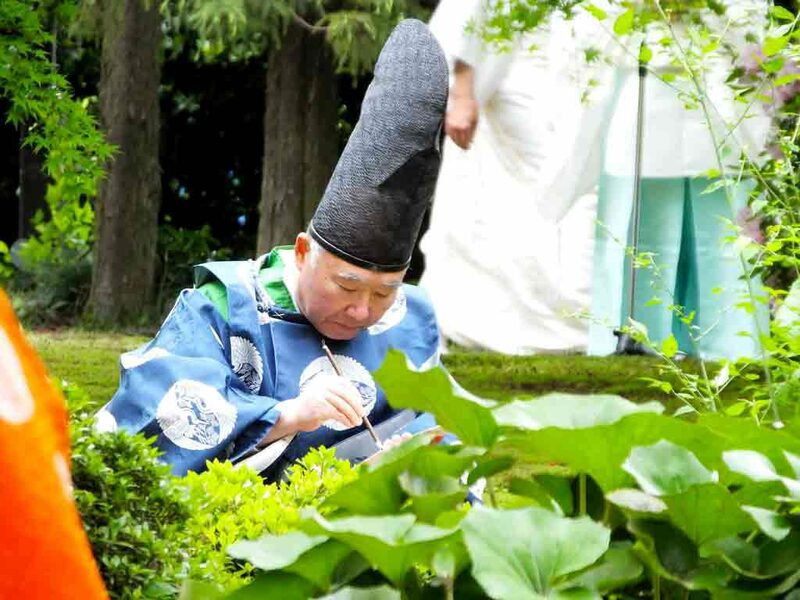 After the ceremony, you can walk into the garden if you buy a human-shaped paper for 300 yen. Put the paper to your left shoulder, right shoulder, and then left again. After that, blow on the paper and float it on the stream. You can purify yourself. In the next picture, there are two floating papers and a tiny boat with four paper dolls on it. They are pretty. 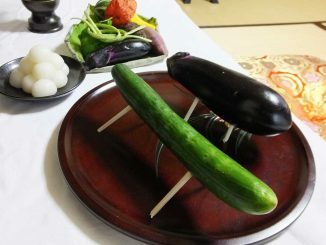 The day of Kyokusui-no-utage ceremony is special. 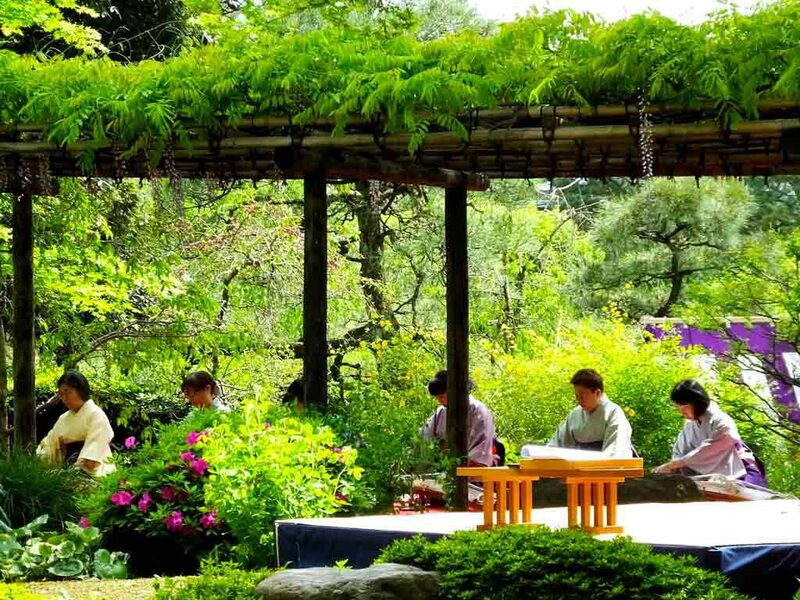 On that day, you can walk into the gardens at Jonangu Shrine for free. The azaleas were in bloom when I went there. Can you see something like a small house at the upper left of the picture? 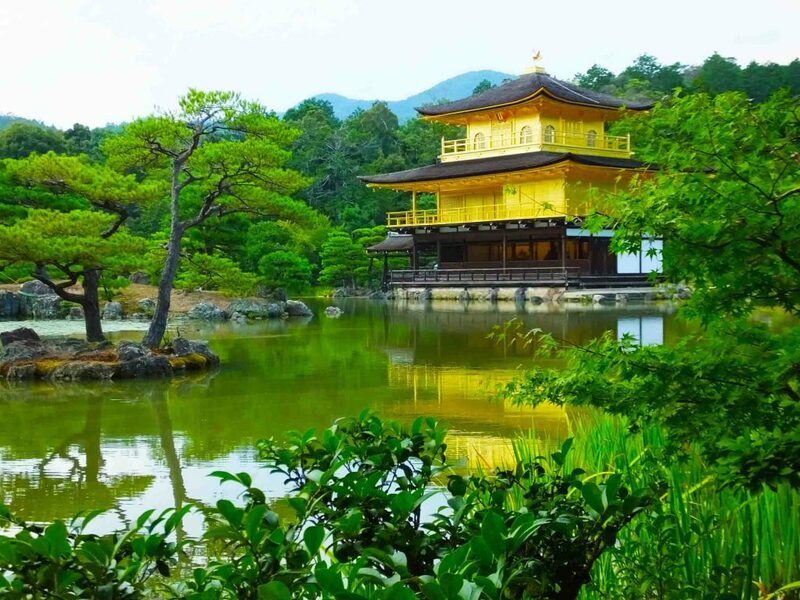 You can have matcha green tea and traditional Japanese confectionery in there for 300 yen. I’ve tried it before. It was great to eat and drink, enjoying the beautiful garden. That made me feel relaxed. 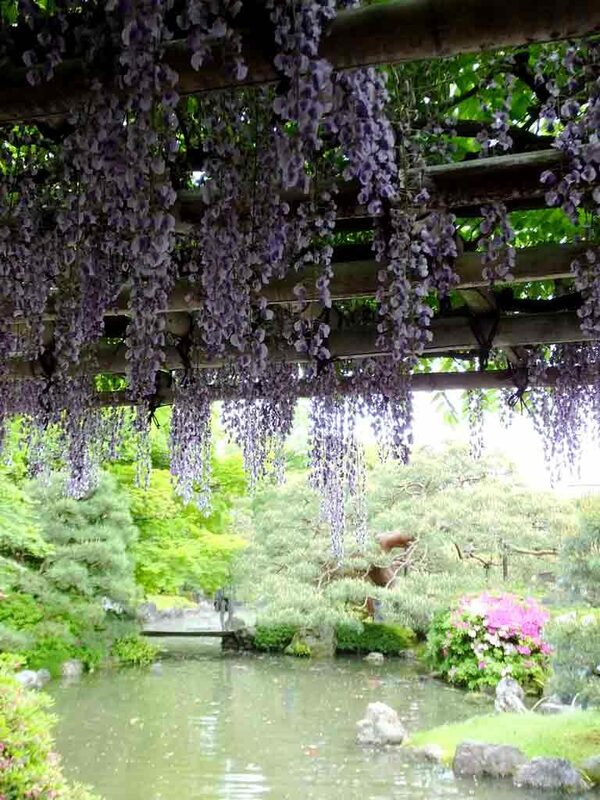 Also, there was a wonderful combination of wisteria flowers and a pond. In the pond, there are many Koi carp (nishikigoi). 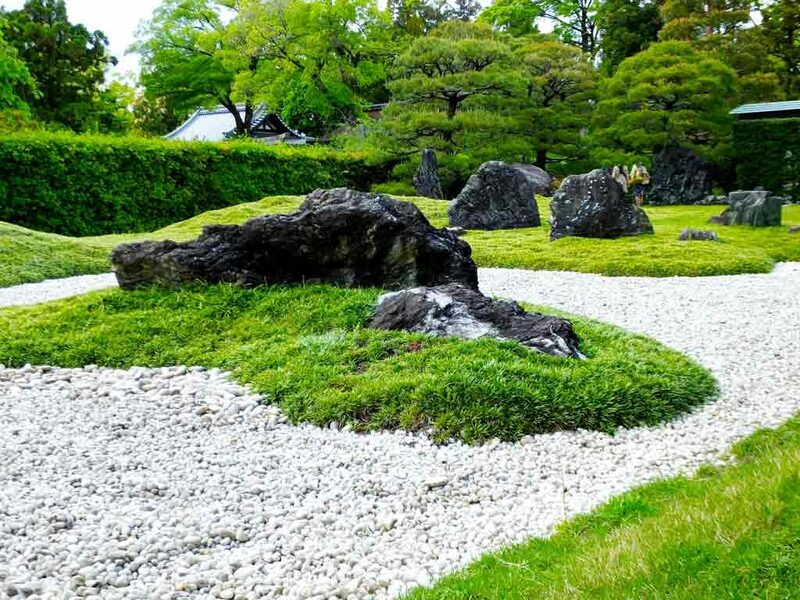 There is a Japanese rock garden, too. It consists of three colors: green, white and black. It’s simple and vivid, isn’t it? There were some people from other countries at Kyokusui-no-utage ceremony. I’m sure those who don’t understand Japanese language can enjoy it perfectly. Watch, listen and just feel!